This was the week when the country’s long-festering crisis turned virulent. A last-ditch attempt to defend the exchange rate by raising interest rates to 17pc failed within hours, yet the shock is surely enough to set off a chain of corporate failures and push banks over the edge. Traders in the City watched open-mouthed as the dam broke on Black Tuesday. The event exposed the awful reality that the Kremlin does not have the infinite foreign reserves that many had supposed. “What is happening is a nightmare that we could not even have imagined a year ago,” says the central bank’s deputy chief, Sergei Shvetsov. The currency has since stabilised at 60 to the dollar. But it has lost half its value in a year. Russia’s $2.1 trillion (£1.3 trillion) economy has shrunk to $1.1 trillion, half the GDP of California. The external debt of Russian banks and companies has by mathematical effect ballooned to 70pc of total output. “A Russian downgrade to junk is only a matter or time,” says Tim Ash, from Standard Bank. Vedomisti reports that there is a de facto run on banks as depositors pull what they can from ATM machines, fearing the guillotine at any moment. Soviet queues are appearing again. Crowds have descended on Ikea stores, converging in pick-up trucks to buy hard goods before it is too late. The company suspended sales of kitchens on Thursday, saying it cannot meet demand. Those scrambling to buy cars may have missed their chance. Jaguar Land Rover has halted sales to Russia. So has General Motors, citing “rouble volatility”. The big three dealerships - Transtekhservice, Major Auto, and Avilon - have frozen sales. As the buying frenzy subsides, the eerie stillness of depression may instead take hold. The central bank says the economy could contract by 4.7pc next year if oil prices settle at $60 a barrel, but that was before the rate shock. BNP Paribas says each 100-basis point rise cuts 0.8pc off GDP a year later. Rates have risen 750 points in a week. It was also before President Vladimir Putin disclosed his second line of defence. “We must squeeze rouble liquidity to stabilise the currency. We mustn’t waste our foreign exchange reserves thoughtlessly,” he says. This means driving the MosPrime (Libor) rates to 30pc. Those borrowing to “short” the rouble are crushed, but so are Russian banks. Western sanctions are still escalating. With wicked timing, President Barack Obama this week chose not to veto a law passed by the US Congress that tightens the noose further, even though he warned previously that it may irk European leaders and erode Atlantic unity. The law implies fresh curbs on the Russian energy sector, and may limit credit to Gazprom. It stiffens Ukraine with $350m of military aid, a high-risk move. The White House says Putin can reverse the process at any time by implementing the Minsk ceasefire deal agreed three months ago. “The aim is to sharpen the choice that he faces,” it says. Putin lashed out defiantly on Thursday, accusing the West of trying to “chain the Russian” bear and tear out its claws. “The issue is not Crimea. We are protecting our sovereignty and our right to exist,” he says. It was vintage Putin, a three-hour tirade, with a strong hint that the oil price crash is due to a plot by the US and Saudi Arabia to cripple Russia. It contained a warning to his enemies at home that there is no safe line between opposition and “Fifth Columnists”. There was a frisson of this at Putin’s press conference, though he deflected a blunt question by saying “there can’t be a palace coup in Russia, because there are no palaces”. Bloomberg reports that Putin asked his key advisers at a secret meeting in February whether Russia had sufficient foreign reserves to withstand a showdown with the West if it annexed Crimea. They assured him that Russia could weather the storm. Putin took a huge gamble. Deutsche Bank and other lenders were already forecasting an oil glut in 2014 as the US flooded the markets with shale oil. Nor did the Kremlin team seem to fully grasp that Russia is far more vulnerable to sanctions now that it depends on foreign capital and is tied into global finance. For the last decade, an elite cell at the US Treasury has been sharpening the tools of economic war, crafting ways to bring countries to their knees without firing a shot. The strategy relies on hegemonic control over the global banking system, buttressed by a network of allies. Iran has felt its grim effects. “It is a new kind of war, like a creeping financial insurgency, intended to constrict our enemies’ financial lifeblood, unprecedented in its reach,” says Juan Zarate, who once led the team. Putin can retaliate in other ways. “He is going to escalate. The huge prize for him is to test the credibility of Nato while Obama is still in office,” says Browder. That worry is shared by many, especially in the Baltic states with Russian minorities. Four fifths of Estonia’s fortress town of Narva are ethnic Russians, and they live within sight of the border. An incident could flare up at any time. “The nightmare scenario is if ‘little green men’ appear in one of the Baltics, and it then invokes Nato’s Article V [mutual defence clause],” says Ian Bond, the former British ambassador to Latvia and now at the Centre for European Reform. Any dispute may be murky. Yet if Nato ever fails to uphold an Article V plea, the alliance withers. Russia was sliding into decline before the storm hit this year. Its trend growth rate had collapsed. 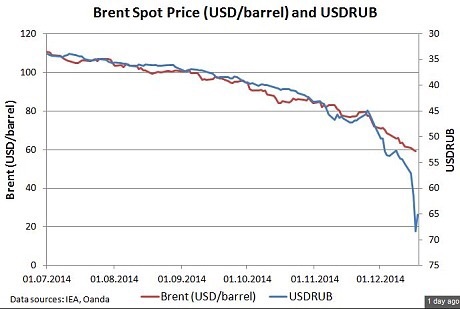 It was near recession when crude was trading at $110 a barrel, a remarkable indictment of Putin’s 15-year reign. The country has become reliant on the commodity supercycle. Oil, gas, and metals together make up 73pc of exports and half the budget. The economy is a patronage machine built on commodity rents, a textbook case of the “Dutch Disease”. The IMF says the effect has been to smother everything else, hollowing out the industrial core. Non-oil exports fell from 21pc to 8pc of GDP. The economy is a tangle of bottlenecks. Russia ranks 136 for road quality, 126 for the ability of firms to absorb technology, 124 for availability of the latest technology, 120 for the burden of government regulation, and 105 for product sophistication, in the World Economic Forum’s index of competitiveness. Critics say Russia squandered its chance to build a modern, diversified economy at the end of the Cold War. It now faces a bleak future as an ageing crisis hits and the workforce shrinks by 1m a year. Lubomir Mitov, from the Institute of International Finance, says Russia is weaker than it was in the Soviet era of the 1980s, when it still made things and brimmed with engineers. “They have lost their technology,” he says. Mitov says it will be lucky merely to repeat the stagnation of the Brezhnev era. Every $10 fall in the price of oil cuts export revenues by 2pc of GDP. The “financing gap” will soon be 10pc of GDP. “It is a perfect storm,” he says. Russia still has $414bn of reserves but this is below the country’s $700bn external debt, in stark contrast to 2008. “In addition to being twice as levered, Russia is entering this crisis with lower reserves,” says Tatiana Tchembarova from BNP Paribas. She says the Kremlin has already committed $143bn of reserves for next year, and “more will be required to support Russia’s banking system”. The bank rescue cost $170bn five years ago. Russia firms must repay $120bn of hard-currency debt over the next year. They cannot roll over the loans. Eric Chaney from AXA warns clients to brace for a wave of defaults by “non-strategic” companies. The Kremlin will prop up national champions but this bleeds their reserves. Browder says Putin is trying every trick to put off the inevitable, but capital controls are coming. “They won’t announce it: they will just starting doing it quietly by forcing companies to convert dollars into roubles,” he says. The Nordic bank SEB says the central bank faces a horrible choice between ferociously high interest rates – perhaps 100pc – or exchange controls. “We think it will reluctantly opt for the latter,” it says. SEB expects the Kremlin to freeze dividends and force companies to repatriate earnings. Isolation and Stalinist autarky lie ahead. What is remarkable is that Russia’s leaders so quickly forgot the lesson of the mid-1980s when collapsing oil prices broke the back of the Soviet Union. Former premier Yegor Gaidar dated the moment to September 1985, when Saudi Arabia flooded the crude market. The Kremlin sold its gold, down to its pre-1917 imperial bars, until it ran out of cash for food imports. “The collapse of the USSR should serve as a lesson to those who construct policy based on the assumption that oil prices will remain perpetually high. A seemingly stable superpower disintegrated,” he said.